Ideal for small groups or family vacations with children who need their own space. Ideal for small groups or family vacations with children who need their own space. 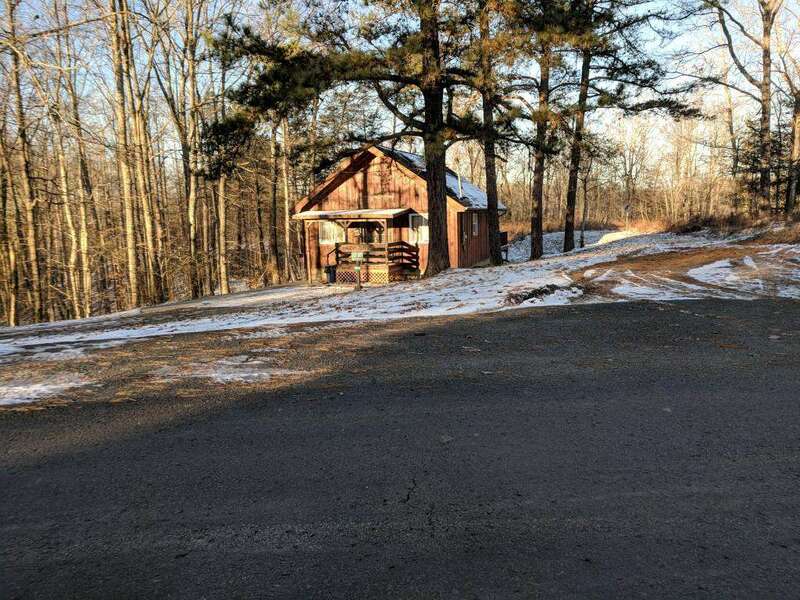 These Three Bedroom cabins nestled in a scenic backdrop with captivating mountain valley views of the Red River Gorge, come with everything from Foosball tables and outdoor fire pits to spacious decks and delightful bedrooms. Search for the perfect getaway for YOU or give us a call at (606) 663-0000! Search for the perfect getaway for YOU or give us a call at (606) 663-0000!! This adorable cabin comes with many amenities and is cutely furnished and decorated. New leather sofa's, TV with DVD player. Cabin has outdoor hot tub, Foosball table, central heat/AC, charcoal grill. Cell service in our area can be spotty. However, this property is only a short distance from our Daniel Boone Coffe Shop & Deli where free wi-fi is offered. This cabin is 2 stories. The upstairs has 2 private bedrooms and one bathroom. The downstairs has a queen bed, bathroom with shower and a gas fireplace. After a day hiking and exploring, sit on the deck, enjoy the view or soak in the hot tub. One, well trained pet is allowed with payment of pet fee. This cabin sits in vicinity of Grizzly cabin and the Black Bear Lodge. Great opportunities for family reunions or large group activities if need more space than one cabin. Master Bedroom has a queen bed with it's own bathroom & small patio, upstairs loft BR has a queen bed and 2 twin beds with private bathroom & small patio, downstairs sleeping area has a queen futon and private bathroom. Cabin can sleep up to 7 people. Quaint kitchen has oven, stove, refrigerator, microwave, coffee pot. There is a washer/dryer, central heat/air and a nice screened-in porch. DVD Player but NO Satellite or Wifi at the moment. Does have Roku TV (can be used with the hotspot option on your phone) & Sling TV. Bear Grass Lodge also has a covered deck with bench, outside fire pit, and level parking area. This cabin has easy access and is not located on a cliff edge; no steep roads and no road problems. Nestled in a scenic backdrop with captivating mountain valley view, this beautiful vacation log cabin is picturesque and fairly secluded. (No cabins within view from deck). Close to both Natural Bridge State Park and the Red River Gorge. 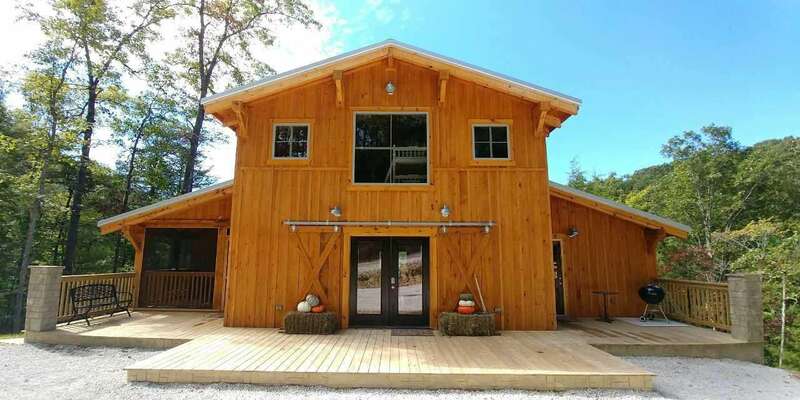 This modern 3-BR, 2-BA cabin sleeps up to 8 people, has satellite TV on main floor, washer/dryer, gas grill, outdoor fire pit, dishwasher, wood burning fireplace, central heat/AC, hot tub & foosball table upstairs. Master BR has king bed, second BR has a king bed, upstairs third BR has twin bunk bed with trundle and small twin built into wall so this room can sleep up to 4 young people. The wall twin bed is only accessible by a ladder. YOUNG CHILDREN MUST BE SUPERVISED WHEN ON LADDER. (Scenic Cabin Rentals not responsible if child falls off ladder or climbing up to a bunk). Upstairs BR also has a tv with Blueray dvd player (It is not on satellite, just for dvd's). All will enjoy a great time grilling out on the wrap around deck or sitting in the outdoor hot tub. With a spectacular view from this house it is no wonder people leave feeling relaxed and refreshed. This beautiful log home and area makes a perfect honeymoon destination. Visit Red River Gorge, Kentucky and relax at Bobcat Lodge in the Scenic Heights neighborhood area! One well trained pet is permitted; a pet fee is required. City Slickers Hideaway is an authentic one story log cabin offering modern amenities with satellite tv, dvd & videos, stone gas fireplace, central heat/AC, washer/dryer. A large L shaped deck surrounds the home with picnic table & large charcoal grill. 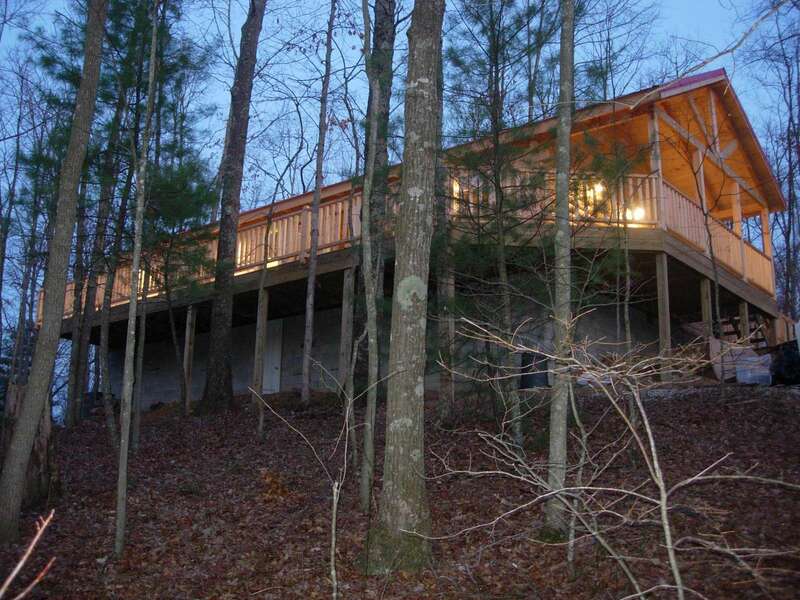 Home is deeply secluded in the woods overlooking a clean, clear fishing pond. Located in Cliffview Resort, with ponds, hiking trail, zipline and restaurant. The house offers 3-BRs, two full BA's; two BR's have a queen bed, and the third has 2 twins. The living room could be a 4th sleeping area as it has a day bed. The master bedroom suite has French doors that open to the living area and on other walls are tall windows creating a deep in the woods feeling. This is an awesome get a way for those who need to escape the congestion and stress of the city, yet don't want to give up luxury and cosmopolitan style. Lots of space with a large great room and one floor design. Authentic ranch style log cabin with a paradise view! New to rental program. Clifftop Haven is the perfect choice for those looking for extreme luxury in a completely secluded landscaped setting. House sits on a clifftop with magnificent mountain top views in all directions. Enjoy peace and serenity in this private setting. This is truly the perfect get away from it all while basking in luxury. This 1600 sq ft house will sleep 6 people in 3-BR , 2-BA and comes with all modern amenities. Two BR's have a queen and one BR has 2 twins. High ceilings throughout, Amish furniture and professional landscaping. House has an outdoor hot tub, satellite tv, dishwasher, microwave, coffee maker, washer/dryer, central heat/AC, gas fireplace, large covered wrap around deck, outdoor firepit, gas grill. Tucked away from the world, you'll feel completely in tune with nature. Within walking distance is 5 acre crystal clear Deer Water Lake in Cliffview Resort, great for fishing and swimming. Lake is stocked and is "Catch & Release". This large Cliffview Resort 1400 sq. ft. log home is perfect for people wanting to get away in a lakefront location and have access to fishing, canoeing, and swimming. The lake is a great place to fish for Bass and Catfish. The view from this cabin is spectacular! There is a shared dock and a shared canoe available. You may bring your own kayak or canoe. Feel free to hike around the lake, although the view is so spectacular from the deck you may not want to leave it. It is a beautiful spot in the winter as the lake remains a clear blue-green color year round. All paved roads except for a short, steep, gravel driveway. 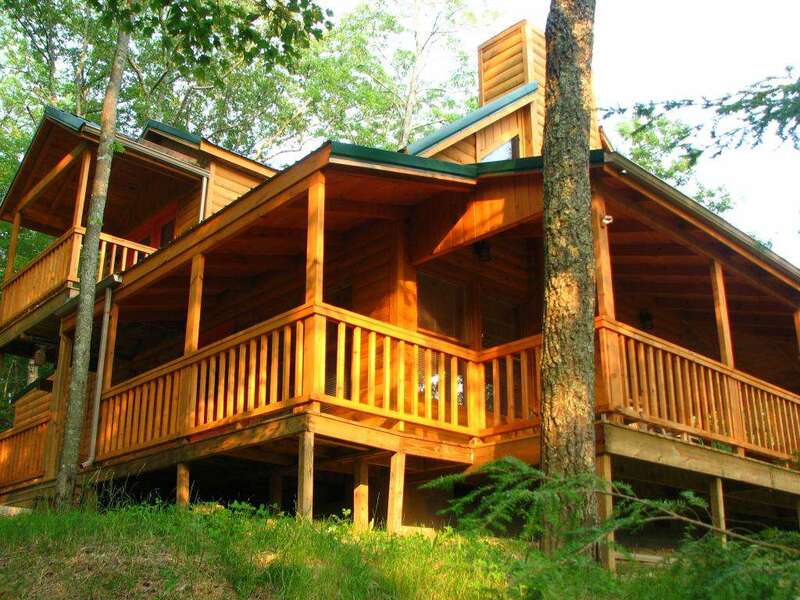 This cabin has 3 BR and 3 baths, and an outdoor hot tub and pool table. It has central heat/ac, stone gas fireplace, satellite TV (in both the living room and master bedroom), high speed internet, landline phone, and a kitchen with a dishwasher and ceiling fans. A washer and dryer are available for those reserving long stays. The master bedroom has a king bed, second bedroom has a queen bunk bed and the 3rd bedroom has one queen for a sleeping capacity of 8 people. Located close to Bake's Burrow and Wuthering Heights, it offers opportunities for large group reunions. "SWIM AT YOUR OWN RISK" - There are no lifeguards on duty. 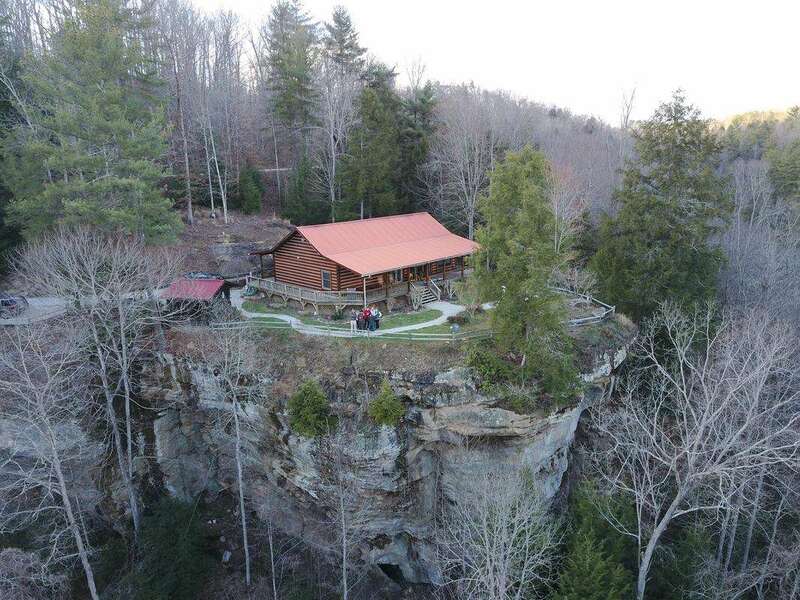 Located near Red River Gorge, Kentucky, in Cliffview Resort, this stunning large cabin is in a beautiful wooded setting overlooking a mountainous gorge. This cabin is perfect for large groups wanting to get a way in a pristine location and have access to fishing, canoeing, hiking. Comes with large open room, Wi-FI, large deck, nice kitchen, 3 bedrooms; two are on main floor and bathroom in each bedroom, third bedroom is huge upstairs room with multiple beds and a bathroom. Feel free to hike around the area, although the view is so spectacular from the deck you may not want to leave it. Very easy hike to the beautiful Suzannah's Arch Trail. This house has easy driving access, no winding or steep roads. Driveway is gravel and has curve, AWD recommended, offers plenty of parking at the bottom of driveway. If 2 wheel drive maintain speed on gravel drive or park at top of driveway. One main floor bedroom has a king bed; second main floor bedroom has a queen bed. Third bedroom has 3 queens, 2 twins . Will sleep a total of 12 people. 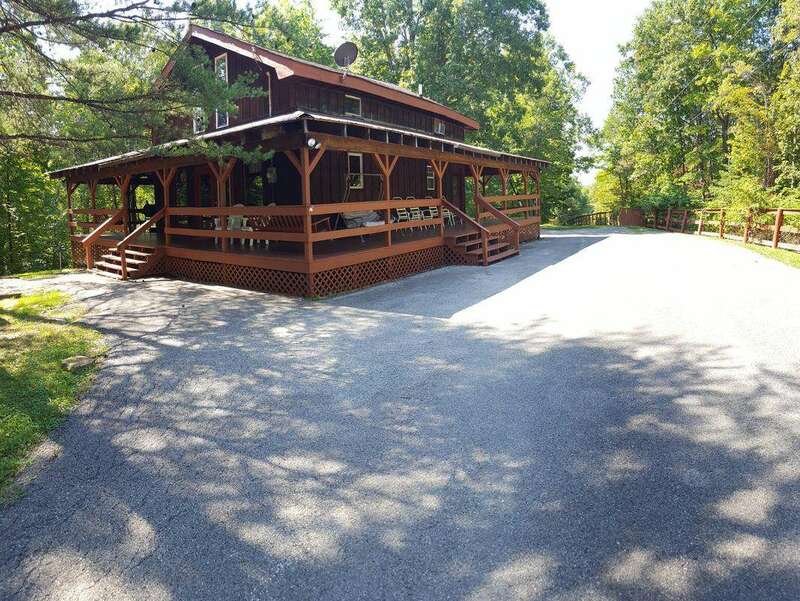 Cabin has central heat/AC, stone gas fireplace, DVD player and over 100 dvd movies/series, cable TV, Wi-Fi internet, kitchen with dishwasher & ceiling fans. Hot tub and charcoal grill. A washer and dryer is available for those reserving long stays. This cabin is much larger and designed for big events. Weddings and retreats are welcome. This cabin has a phenomenal view of the valley. Relax on back deck or in hot tub with this breath taking view. Two bedrooms have a king size and the third has a full size bed. Two bedrooms are upstairs and master is downstairs with a private Jacuzzi Tub, private 42'' flat screen DVD player and access to the first floor Full bath. Second bathroom is upstairs. Cabin can sleep up to 6 people. Cozy family room with beautiful stone wood burning fireplace. Large kitchen comes with dining tables and chairs, oven, stove, refrigerator, dishwasher, microwave, coffee pot. There is a washer/dryer, central heat/air, satellite tv with DVD Player, and covered outdoor hot tub on back deck. Enjoy time with friends on the covered back deck with this phenomenal cliffline view. Hickory Ridge has outside fire pit with charcoal grill and level parking area. For Climbers: this cabin sits atop the Legendary Lady Slipper Climbing crag. (100 yards or so right of "No Place Like Home 11c") Clip Bolts & place gear all day, then pull the top-out to a toast at your cozy cabin. This cabin has easy access with flat roads, no steep roads and no problems. Last half mile is a gravel road. Allows one well trained pet. Pet Friendly, one well trained pet allowed. 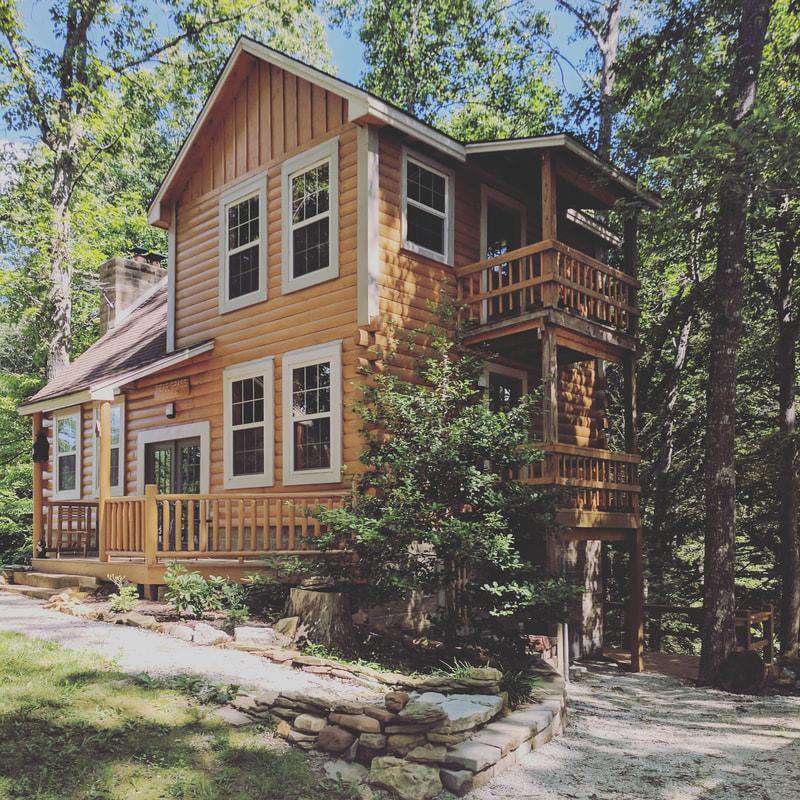 Located near Red River Gorge, Kentucky, this cabin sits on a 5 acre lake. There is a shared dock and shared canoe available. Canoe may be old so feel free to bring your own canoe or kayak. You can rent paddles from our office. There is a nice hiking trail behind the house that leads to a cave and a creek. You can often hear the waterfall in the spring and fall and in the winter it is frozen over with magnificient icicles. It remains a beautiful spot in winter as the lake remains a clear blue green color year round. This house has easy driving access.. 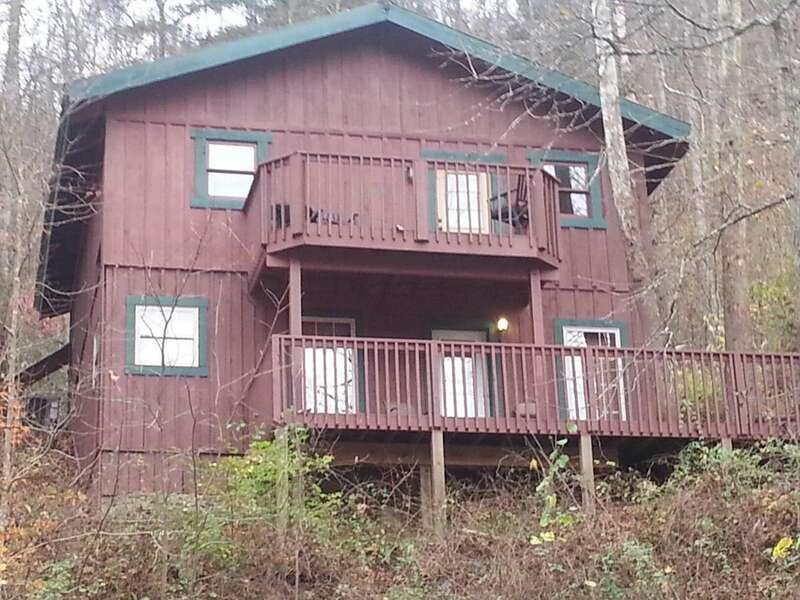 This cabin has 3 BR / 3 Full Baths, and an outdoor hot tub. It has central heat/ac, stone gas fireplace, satellite TV/VCR/DVD/CD player, wireless internet, kitchen with dishwasher, and ceiling fans. A washer and dryer are available. The master BR has a queen bed, second BR has 2 queen beds, and the third BR has one queen bed and 2 twin beds for a sleeping capacity of 10 people. Located close to Lakeview Retreat, it offers opportunities for large group reunions. Newly remodeled, modern, 3 bedroom (2 private, 1 loft), 1 bath, sleeps 8. Located in Cliffview Resort. Two private BR each have a new queen bed and mattress, upstairs loft BR has 4 new twin beds and mattresses. Satellite TV in living room, DVD/Game TV in Loft, fire-pit, private large back deck with a newly installed hot tub, paved road all the way to front steps. Gas fireplace, Electric stove, Central A/C & Natural Gas heat, Granite kitchen & bathroom counter-tops, Bathtub/shower. Open Kitchen and living room. All new sofas, beds and pillows. Outdoor Hot Tub! So hike and then relax in your private hot tub with your favorite drink. Located in front area of Cliffview Resort so easy access for any type car. Easy walking to the Suzannah's Arch Trail. Catch & Release fishing ponds available. Does allow one well trained pet. Pet Fee Applies. Enchanting, spacious log cabin with 3 BR's and den with day bed to accommodate extra sleeping capacity. Has 2 full baths. Two BR are private with a queen bed, third BR has twin bunk bed with a trundle bed. Sleeps 8 people. 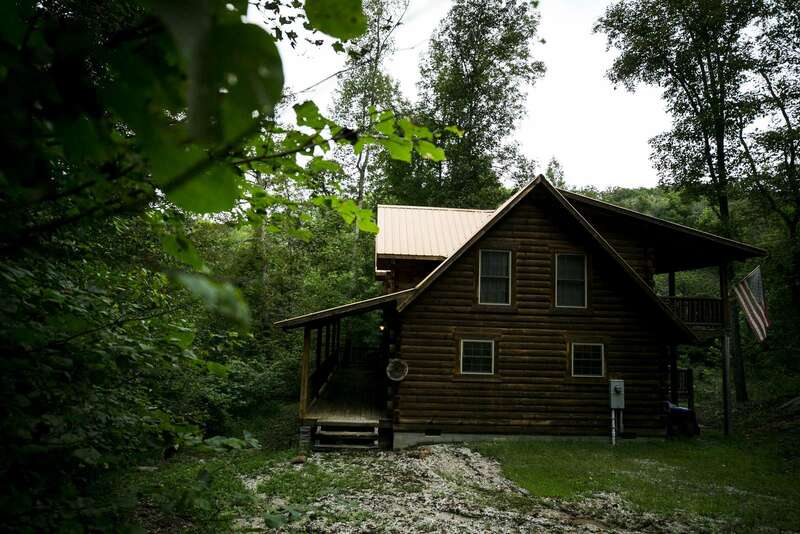 Cabin is well furnished with central HVAC, washer & dryer, dishwasher, coffee pot and Keurig coffee maker, has 2 TV's with local channels (gets about 10), both TV's have a blu-ray player with lots of movies provided, has a Play Station 3 with games provided, has gas and charcoal grills, outdoor fire pit with benches. The downstairs den makes a fantastic game room with Foosball, Air Hockey, card table, and outdoor ping pong table. Cabin has two covered decks and main deck has outdoor furnishings. Sits secluded atop a knoll with phenomenal, panoramic mountain views. 4 wheel or all wheel drive is highly recommended. Outback cabin in Cliffview Resort is designed for groups or close families that want to be outdoors. It sits on a 3 acre lot. Cabin has 3-BR & 2 full BA. Sleeps up to 9 people; one BR has a queen bed; the upstairs BR has a queen size bed and the third BR is a large loft BR with 5 twin beds and smaller size pool table. Although it was designed for groups because of the large lot, large wrap around deck & picnic area; couples and small families often use it as a perfect retreat house. It has a complete kitchen, satellite TV with movie channel, VCR, DVD, OUTDOOR HOT TUB, gas fireplace, gas grill, charcoal grill, porch swing, wrap around deck, two bathrooms, fire pit with chairs, gas heat and three window air conditioners, picnic grove with 5 picnic tables. ​It has a nice private, wooded view from back porch and a horseshoe pit. Just a few yards away is a beautiful lake great for fishing at the bottom of the hill in the back yard. Also, within walking distance of a great hiking trail called Suzannah's Arch Trail and the Zipline office. This home will allow a well trained pet for an extra fee. Although this house sleeps 9, it was designed for outdoor entertaining with lots of covered deck space, picnic grove and large, fantastic lot. It comfortably seats 7 people in the living room and 6-7 around the kitchen table, so it does not have living or eating space inside for 9. For groups who require large indoor space look at our large cabins that sleep up to 12, they have lots more floor space. The large paved driveway allows for horse or ATV trailers. This cabin does have a corn hole game provided, but you will need to either bring your own bean bags or rent them from our office. Cost for rental of bean bags is $5.50 including tax. Main floor consists of the living room, kitchen, the private bedroom and a bathroom. Cabin has central heat/AC, satellite TV, electric fireplace, outdoor hot tub, washer/dryer, vcr/dvd player, and gas grill. The large den has a pool table and a table for up to 6 people to play cards. 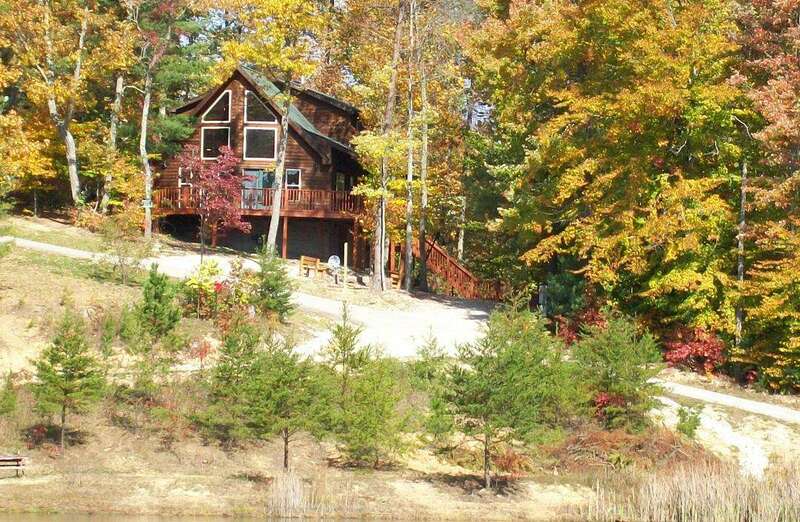 This cabin sits on 3 acres with fantastic views of a clean clear pond. After a day of hiking and exploring sit on the dock and try your hand at fishing. Centrally located to all the parks and hiking opportunities, particularly close to Muir Valley and Pendergrass Murray climbing areas. Built in 2014, this new log cabin located near Nada Tunnel in Red River Gorge/Natural Bridge area. This cabin has 3-BR, 2 full bathrooms with shower tubs, central heat/AC, washer/dryer, covered porch and 2 back decks, fire pit and grill. Master bedroom has a king size bed (2 twins secured together), the second bedroom has a queen bed and third bedroom has a full size bed. This cabin has a TV for dvd's and video games only. There is no satellite or cable tv service. Cabin has board games available. This delightful log home sits on several acres in a heavily forested area overlooking a mountain valley view and is completely secluded. A 4 wheel drive or all-wheel drive is required for this cabin. We do require check-in by 9 p.m. for this cabin otherwise we are not responsible for guests getting lost. This cabin is not motorcycle friendly due to long and steep gravel road. Shiloh Cabin is a newly renovated, one story log cabin offering modern amenities such as WiFi, 42'' flat screen satellite TV, DVD players, outdoor hot tub, gas grill, gas fireplace, central heat & A/C, & washer/dryer. New furnishings and bedding in 2017. 3 Bedroom, 2 Full bath; Master bed has a King bed, New private full bath, walk in shower, access to washer/dryer stackable unit. 2nd bedroom has a Queen bed, private DVD player with 32'' flat screen, and private access door to the back deck. 3rd Bedroom has two long twin beds. Living area has lots of space with a nice great room and open concept layout. Offers front covered deck with rocking chairs and back deck with patio furniture and gas grill. Sits off the main road in Cliffview Resort. Cliffview Resort is a gated community with ponds, hiking trail, and a Zipline. Makes an awesome get away cabin, close to others in Cliffview Resort . Great for motorcycles, very easy access and easy to find. Walk through the entire house and deck without taking a step up or down which makes it perfect for wheel chair friendly access. Only minutes from Natural Bridge State Park. Twin Oaks, a brand new log cabin, sits in a privately owned 400 acre forested paradise. Feel free to hike and explore the area on your own or take an already established trail the owners have made. Perfectly secluded, near the town of Stanton so options for restaurants or shopping. Red River Gorge and Natural Bridge State Park are just a few minute drive down the parkway or take a scenic back road and go right into the Gorge. Home has a large front porch with great views of the mountain valley. The master bedroom has king bed & private bath. The second BR has a queen bed, third BR has a Queen bed. There is a sleeper sofa in the living room. The house has all modern appliances, leather sofa and love seat, flat-screen tv above the fireplace with High Def, Wi-Fi internet, DVD player & a wood burning fireplace. Outside is a hot tub, gas grill, fire pit and corn hole game. Bring your own bean bags. This cabin is near the one called Creekside Haven so if you have a large party and friends, bring them along and book both cabins. As this house sits high on a hill, it has a long gravel driveway and the gravel is new and still loose. *We recommend all wheel drive, four wheel drive, unless you are used to driving steep gravel roads. Maintain your speed when driving up the hill and you shouldn't have any problems, it is when you stop or slow down that small cars are having trouble.